An explosion and chemical release last Thursday temporarily shut down the Wacker Polysilicon facility in Charleston, TN. 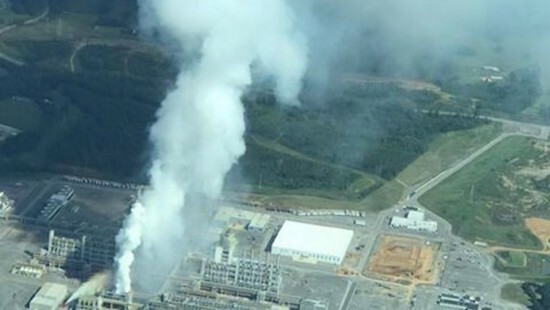 Wacker Polysilicon’s Charleston, TN, plant will temporally shut down operations as officials work at determining the cause of a blast at the facility last week. The company, which employs around 650, pinpointed where the mechanical failure occurred that led to an explosion and the localized release of the chemical chlorosilane. However, why the explosion and subsequent release occurred is still being investigated. Hudson said operations at the site will be suspended as the situation there is investigated and the cause determined. Hudson explained that chlorosilane, once it gets into the air, immediately reacts with moisture in the air to form HCl (hydrochloride). Two Wacker employees sustained injuries on site, while “there were some off-site people who drove themselves to the hospital to be monitored,” said Troy Spence, Cleveland-Bradley Emergency Management Agency director. He added four Bradley County Sheriff’s Office employees also drove themselves to Tennova Healthcare-Cleveland to be monitored. Hudson said the investigation into the explosion and chemical release will end up conducted by more than just the company. “We will fully investigate the incident, not only with our employees, but working with external government agencies,” the plant manager said. “The incident is completely contained, and the chemical release has been mitigated,” Hudson said. Hudson said the first action was the company’s incident response team responded to the area of the plant where the explosion and release occurred, “where they took immediate action to contain that release, and that containment involves spraying water on the chemical release which creates a large vapor plume. “It looks very ominous, but that vapor plume is primarily water and steam and the reason we are spraying this water so we can contain this chemical and prevent it from going off site,” she continued. The company also, as part of its emergency plan, has a process for removal of water if used in any similar incident. “It goes into our waste water treatment system, and is treated,” Hudson said. Spence said the agency has worked with Wacker in the past, and has an emergency plan in place in case they are needed to help. Hudson said not only did the company monitor the area of the facility, “but the perimeter and the community and we were assured by the results of our monitoring that we were containing the incident and the chemicals on site. The chemical plant has faced previous fines of almost $10,000 for three workplace safety violations since opening last year. Records show the Wacker Polysilicon plant in Charleston was fined $3,500 in April 2016 by the Tennessee Occupational Safety and Health Administration over control of hazardous energy. In August 2016, a $6,450 fine was issued over process safety management of highly hazardous chemicals and respiratory protection.